[row][span12] [content_box custom_class=”wht_gray”] [row_in] [title_box title=”SOLUTION CHARACTERISTICS”] [frame align=”left”] [/frame] The modular system Climatic was dedicated to the medical building requirements, where at each stage of both design and implementation, it is possible to adjust the building to other customer’s requirements and to adapt the system to other construction applications. 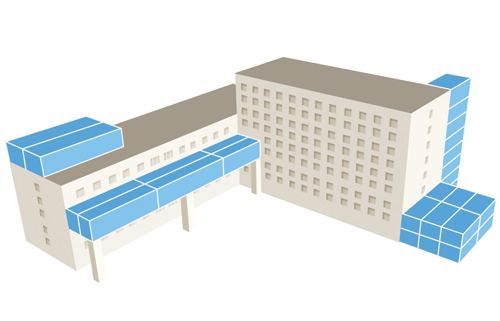 existing building structure (in the case of the superstructure of existing buildings). the superstructure on the existing buildings. [frame align=”right”] [/frame] Depending on the needs, modular system Climatic enables multi-storey building. In addition, any non-standard configuration may be possible – Climatic engineers can prepare a target construction or expansion concept of the building based on individual guidelines. Modules delivered to the construction site can be almost finished with full technical equipment and all installations – according to customer requirements. Modules prepared in that way for construction are only joined together and finished as well as adapted to the already existing infrastructure. In the case of the projects where the room is located entirely within a single module – the premises are turnkey prepared (unless other conditions prevent it, for example: installation equipment guidelines). 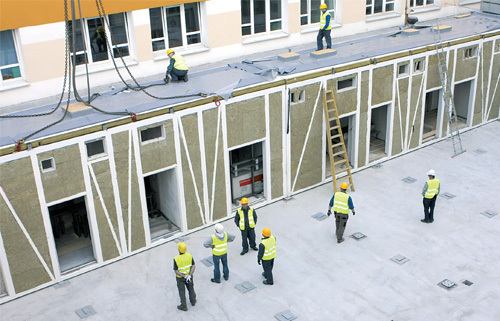 For projects in which certain room covers an area of two or more modules, prefabricated modules are substantially finished, however the rooms are finally finished after site installation (this applies to all communication routes, operating theatres, gyms, staircases, etc.). Thanks to its versatile design a modular system Climatic may be an extension of the building in any configuration and at any level – the system makes it possible both to be extended at a ground level (typically up to 5 floors), as well as to be developed at any level (as a self-supporting structure independently supported on poles or partly based on existing building) and the superstructure on the roof (it is a particularly attractive solution in case of problems with difficult engine rooms installation). Mobility and versatility of that solution allows to use the modular system also in locations with very limited access, such as a patio or the roof of the building. With an experienced installation staff even complex implementation is done quickly and efficiently.